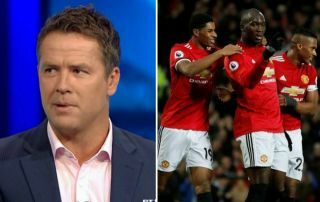 Manchester United take on Sevilla in the Champions League tonight and their former striker Michael Owen has something of a warning message for them ahead of the game. The ex-Red Devil saw how dangerous Sevilla can be as a goal threat during their meetings with Liverpool in the Champions League group stage, where they notably fought back from 3-0 down to draw 3-3 with Jurgen Klopp’s side at their stadium. United would take a similar result tonight due to the away goals rule coming into effect, and that’s looking one of the safest bets with daily football tips ahead of this big match. Still, it serves as a warning for Jose Mourinho not to take the Spaniards lightly if they are to progress further in this competition this season. Predicting a 1-1 draw, Owen told the Metro: ‘Sevilla conceded 12 times in their six group games but they showed against Liverpool in both ties in the group stages that they could also score goals.